As a huge thank you to everyone who reads Louisiana Bride and follows on Facebook, Twitter, IG and everywhere else I am having a little celebratory giveaway! We hit 200 followers on Facebook and with GFC this week, whoo hoo! 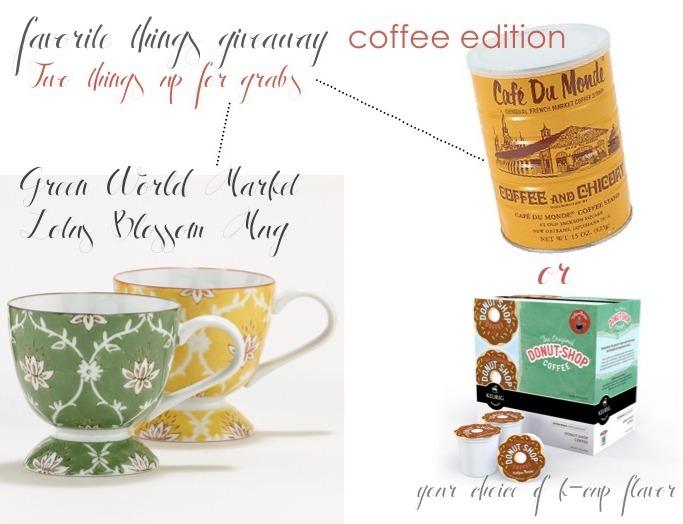 Since I am a coffee addict, thanks to Jeremy, I thought it would be neat to do another favorite things type giveaway, but do it with coffee! So you have the chance to win a super cute green Lotus Blossom coffee/tea mug from World Market and either a can of Cafe Du Monde coffee or a box of your favorite K-Cups. You get to pick, mainly because not everyone has a coffee maker anymore, a lot of people use Keurig these days. So, who wants some coffee and a cute mug? Giveaway sponsored by Louisiana Bride. I was in no way paid to promote these brands, they are just products I love, products were purchased by Louisiana Bride.